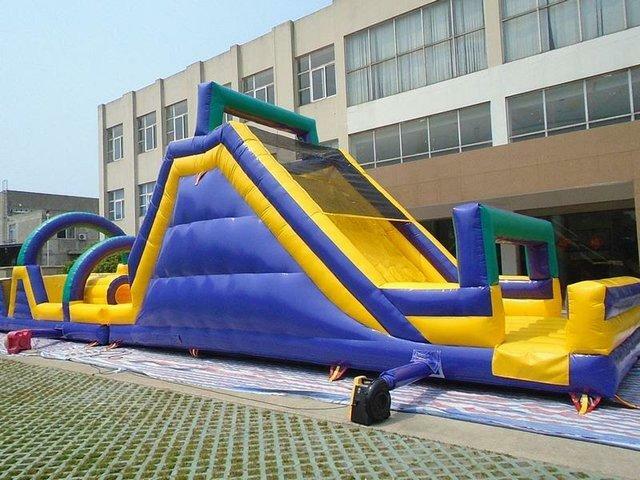 Rent out this amazing 60' Obstacle Course for your event today!! This course features an incredible 60' of fun. start off by crawling through the beggining tubes the fighting your way through inflated pillars both horizontal and vertical!! Find yourself leaping over humps and coming up to the 18' high clib and slide!! This unit is great for any large scale event!! Either race and run through or take your time and see if you got what it takes to get to the end. Revserve online today!! *Due to exessive weight must be no incline or slope to setup are also must be clear forcast no rain.